Snowflakes are a phenomenon that amazes us all. add a touch of dimension and iridescence. 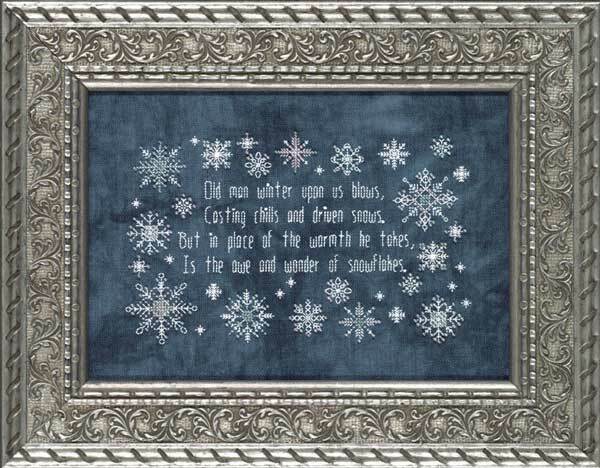 Rounding out the design is a very short verse about the awe and wonder of snowflakes. Casting chills and driven snows. Is the awe and wonder of snowflakes. Fabric: Stitched on 28 count Mystic Cashel Linen hand-dyed by Picture This Plus. Materials Summary: Stitched using 1 strand of Caron Wildflowers™ thread over 2 threads of fabric.